Welcome Spring by washing the wear of winter off the outside of your home or office building. Power washing, cleaning your awnings, washing the outside of windows, and cleaning out your gutters will freshen up the exterior and help extend the life of these areas. Let the sun shine in, but clean those windows first. Make sure you have the right equipment and a safe plan for getting to difficult places. Wash your windows on a cloudy overcast day to avoid leaving streaks behind. Saturate difficult spots and let your cleaning solution sit for a few minutes before wiping. Specialty windows that are tinted, colored, stained, or painted – those that block UV rays, filter sun, or provide privacy – need extra attention and the right type of cleaner. If you have leaded windows that are framed in metal, copper, etc., they require special solution that is safe for these metals. The right supplies are key. Secluded windows are ideal real estate for hornets’ nests. They like to nest between the pane and frame, so proceed with caution when cleaning windows in these tricky spots. If you have double hung windows that open both up and down, it’s best to test out your plan first for how you will get to all of the glass surfaces. Storm windows are complicated as well, so figure out how to remove them and clean them out of the window before you store them for the season. Nap’s is experienced with cleaning different types of windows. Call today for an estimate. Winter storms can drop all sorts of debris inside your gutters. If there are leaves, acorns, pinecones and branches on your lawn, there’s more that landed on your roof first, then in your gutters. This can add extra stress and over time, can cause irreparable damage. Gutters control and guide rainwater flow away from your home preventing damage to the exterior. Water that isn’t properly dispersed can cause toxic mold, ruin your landscaping, and cause wood trim to deteriorate. If you don’t maintain your gutters, you could have to address costly roofing, siding, and foundation problems. Because gutters are up high and out of view, it’s difficult to spot small problems. It’s crucial to inspect gutters as well as the gutter hangers, and any installed gutter extensions. Cleaning out gutters and downspouts is a very physically demanding job that requires a lot of time and effort. Nap’s is happy to schedule an appointment to take care of your gutters for you. Cleaning your awning can be a task that you forget to address. Regular cleanings will extend the life of your awning and keep it looking like new. It will also help to protect it from the damaging effects of dirt, pollution, bird droppings and the sun’s harsh UV rays. Many manufacturers require regular cleaning of your awning to keep their warranties valid. Just rinsing the awning won’t remove built-up dirt acquired from everyday pollution. Replacing an awning will cost much more than having Nap’s Maintenance provide cleaning services for your awning. Start with an overall power washing of your house or office building. With the right power washer, attachments and detergent, your exterior will get a Springtime facelift. The best choice is a heavy-duty gas powered pressure washer, which has more power than an electric one. The stronger flow will result in a time efficient and thorough cleaning. Invest in detergent. Don’t rely solely on the pressure of your power washer to remove dirt. Too much pressure could damage your siding because more water force will be required to remove the dirt and grime. There are specific detergent solutions for different siding, so get the one best suited for your home or office building. A brush attachment will gently loosen dirt so it washes off easily. An extension wand is great to clean high areas that you can’t reach. Don’t ever get on a ladder with a power washer as the change in water pressure can throw you off balance and off the ladder. 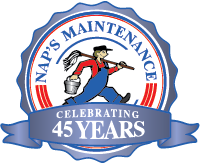 Contact Nap’s today for your best power washing options. New Customers - Mention our new website and get 10% off ! Sign up today for emails and be the first to learn about special offers, exclusive events and more!